Cyclones are among the most dangerous and most destructive natural disasters that can occur. They have been responsible for about 1.9 million deaths worldwide over the last two centuries, and it is estimated that 10,000 people are killed each year by these storms. Cyclones tend to do the most damage in coastal areas, where they have been known to alter the landscape and remove forest canopy. The most prevalent and perhaps best understood effect of cyclones is strong wind. In fact, these strong winds tend to affect the other destructive agents of cyclones. Low-level winds will typically be stronger on the right side of a cyclone in the Northern Hemisphere, but the wind strength tends to be highly variable no matter where a cyclone hits. The strong winds of cyclones can cause damage over an area of 25 km in smaller systems and up to 500 km in larger systems. Winds have been known to destroy smaller buildings and knock out power for thousands of people. 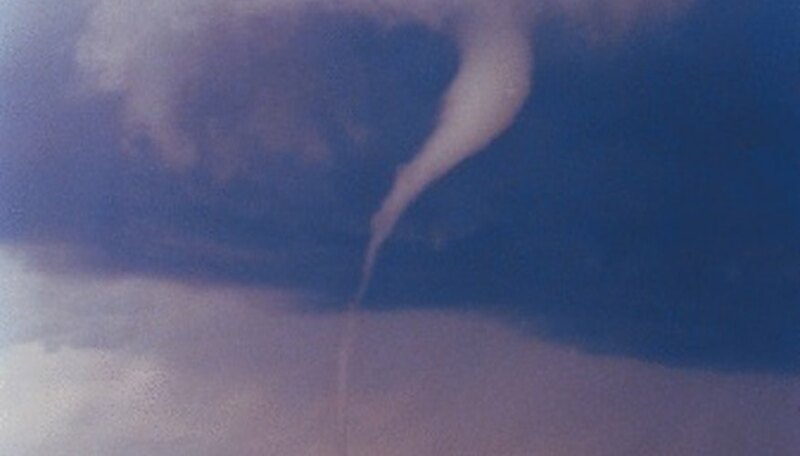 Tornadoes do not normally occur in the same tropical regions that cyclones usually affect, rather tornadoes generally come from the storms in coastal regions and on islands. They may be far more common than people once believed. Cyclone-spawned tornadoes are often not reported in regions such as the Caribbean, but some damage patterns suggest that they occur frequently. Tornadoes can attain wind speeds of up to 480 kph and can stretch more than 3 km. Cyclone tornadoes tend to occur in the outer edge of the eyewall cloud, in the right-front quadrant of the storm system. The thunderstorms produced in a cyclone system produce intense rainfall -- causing massive flooding, mudslides and landslides. This flooding tends to be more severe and destructive inland due to poor preparedness. Although this rainfall can be very destructive and cost millions of dollars in damage, rain in smaller cyclone systems can actually be beneficial when it provides much needed rainfall to drier areas. A storm surge is an abnormal rise in water that occurs during a cyclone. Potentially disastrous surges occur in coastal areas with low-lying terrain that enables inundation. The storm surge is typically the most damaging effect of cyclones, historically resulting in 90 percent of tropical cyclone deaths. When combined with strong winds, storm surges can produce massive waves that can cause inland flooding and destruction. What Is the Difference Between a Nor'easter & a Hurricane? What Causes a Tropical Revolving Storm? Stetson, Chad. "Harmful Effects of Cyclones." Sciencing, https://sciencing.com/harmful-effects-of-cyclones-12543101.html. 25 October 2017.